I decided to break this list into groups of 3. Why? I don't know, 3 just seemed like a good number. The point is to honor all of the best Bearcats of the decade. And when that is in doubt, I'll go with my favorites. I was going with my favorites anyway, but saying I'm narrowing things down from the best makes this list seem a little legitimate. All stats are taken from statsheet.com. All pictures are from google search, and I'll give credit if I catch a source. First, let's tackle the players who didn't quite make the list. Field Williams wasn't the best guard of the 00s. Not close. But the man had a wet jumpshot. Only once did he shoot less than 43% from 3. Field also had his name of the back of his jersey his senior season. 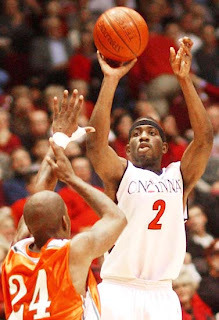 Williams averaged 8 points a game his UC career, but put up 11.6 and 11.9 his junior and senior years. More importantly than all this, one year I worked Midnight Madness as an usher or something. I was positioned at the end of the table, right next to Field Williams. I talked to him and Taron Barker for about half an hour and they signed my hat. Unprofessional I know, but it's why Field makes this list. 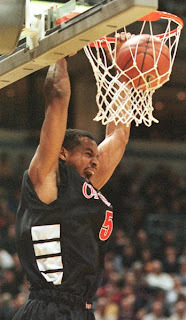 Tony Bobbitt was one of the most excitable Bearcats of all time. He was only a 2 year play, like McElroy. He was known as the Microwave, or something just as goofy. The long lasting image of Tony for UC fans was this shot, after he hit the huge 3 pointer to beat East Tennessee State in the NCAA tournament. Haters of Bobbitt remember that time when the dude on DePaul punched him in the balls. I choose to remember the good moment. 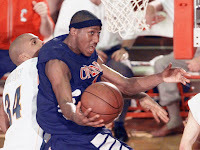 Tony averaged 10.9 points his career. 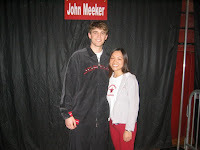 As a senior 6th man, he put up 13.4 a game with 1.5 steals and 3.4 rebounds. what about Jason Maxiell???? ?he should be on your list..